If you've been diagnosed with otosclerosis, your doctor may recommend stapedectomy surgery. Otosclerosis is a self-limited bone growth in one or both ears that can cause hearing difficulty. As the bone growth becomes larger it can lead to progressive hearing loss. To avoid this, you may want to consider having the stapedectomy procedure done. A stapedectomy is a type of ear surgery performed to treat otosclerosis-related hearing loss. The bone buildup of this condition keeps the stapes (stirrup bone) from properly moving and this results in conductive hearing loss. An ENT surgeon performs stapedectomy surgery to add an artificial part in place of the stapes. Successful surgery allows sound to transmit to your inner ear from your eardrum again. Normal hearing is restored with this surgery in over 90 percent of cases, reports the American Academy of Otolaryngology - Head and Neck Surgery. Surgeons perform this surgery when otosclerosis is the primary reason for your hearing loss. The surgeon will treat the ear with the worse hearing first if the condition is affecting both ears. Not all otosclerosis patients require stapedectomy. In some cases, their loss of hearing isn't bad enough to need surgery. In these cases, individuals prefer the use of a hearing aid over surgery to help their hearing. Surgery can also help with hearing aid use. Stapes fixation-related conductive hearing loss. Overall good health where you're able to tolerate anesthesia, particularly when you need general anesthesia. Good cochlear reserve showed by good speech discrimination presence — not necessarily a universal requirement though. The ear with the worse hearing should undergo surgery first, based on your report instead of an audiography. The surgeon typically performs the stapedectomy procedure at a hospital or surgical center. You'll receive a general or local anesthetic. A general anesthetic relaxes your muscles, putting you asleep and preventing you from feeling any pain during your surgery. A local anesthetic numbs the area of your body where you'll have the operation. In some cases, you're given a sedative along with a local anesthetic to help you relax. Often, an external incision isn't needed since the surgeon can go through the ear canal to access the middle ear. The surgeon uses an operating microscope to make an incision in your ear canal. They lift your eardrum carefully. They then remove the part of your stapes located near the other middle-ear bones and using either a laser or drill, they create a small hole in the area of the stapes close to your inner ear. They place one end of a tiny plastic or metal cylinder (prosthetic piston) in the hole, attaching the other end closest to your middle-ear bone. The piston works like a moveable link between your inner ear and the remaining middle-ear bones. Sound waves cause vibration in your eardrum which then moves the piston and your middle ear bones. The surgeon then returns your eardrum to normal position and holds it in place with a packing material for the recovery period. If your surgeon discovers the stapes is not otosclerotic (it moves) after they open your ear canal, they can typically still correct your hearing with another type of prosthesis. The entire surgery takes around 1.5 to 2.5 hours to complete. Dizziness and nausea: These symptoms are expected and quite common after surgery. They're also typically short-lived and mild. Your doctor can give you certain medications to prevent these symptoms. You might also experience a little dizziness beyond your surgery day. For a few days, you may feel sensitive to motion. Temporary taste change: You have a taste nerve that runs under your eardrum. For surgery, the surgeon needs to move this nerve out of the way. This could lead to a temporary taste change on the side of your tongue or loss of taste. High-frequency loss of hearing: You'll have improvement in the other frequencies which make up for this. Lack of or no hearing improvement. Hearing remains the same. Damage to another ear bone or a perforated eardrum. This is rare. Tinnitus: This generally improves after surgery with hearing improvement. However, it can worsen in rare cases. Complete loss of hearing: While extremely rare, if this were to happen, your hearing lost wouldn't be restored with a conventional hearing loss. Facial nerve paralysis: Also very rare. Hearing loss recurrence: If this occurs, you'll need to undergo another surgery. Anesthesia risks: Talk about these risks with your doctor. Bleeding or infection: These symptoms could occur. Tear or hole in your eardrum: Surgery will fix this. Remember, every treatment or procedure has its own set of risks. Consult with your doctor ahead of time to see how they might apply to you. Your doctor will answer any questions you have and concerns. You'll begin your stapedectomy recovery in the hospital bed for several hours to prevent nausea and vomiting. A nurse will then help you get out of bed and walk. If you're not experiencing any significant nausea or dizziness at this point, they'll likely discharge you. You might have a headache or some ear pain and be slightly dizzy for a few days following your surgery. You may feel as though your ear is "stuffy" or blocked. As the eardrum begins healing itself, and your doctor removes the gauze or cotton they packed in your ear canal, this tends to get better. They usually remove the packing about a week or two after the procedure. You may notice some bloody fluid draining from your ear a day or two after the doctor removes the packing. It may take several weeks before you notice any difference in your hearing or it may improve immediately. It will typically continue improving in the next couple months after surgery. Talk to your doctor about when these things are inappropriate. Activities like these can keep your ear from properly healing. You may resume a normal diet immediately. If you have an upset stomach, try eating low-fat, bland foods like yogurt, plain rice, toast or broiled chicken. Avoid dehydration by drinking plenty of fluids. And, take all medications as directed by your physician. An important part of your treatment and recovery is follow-up care. So, make sure you schedule and go to all follow-up appointments. If you're experiencing any problems, call your doctor right away — don't wait. 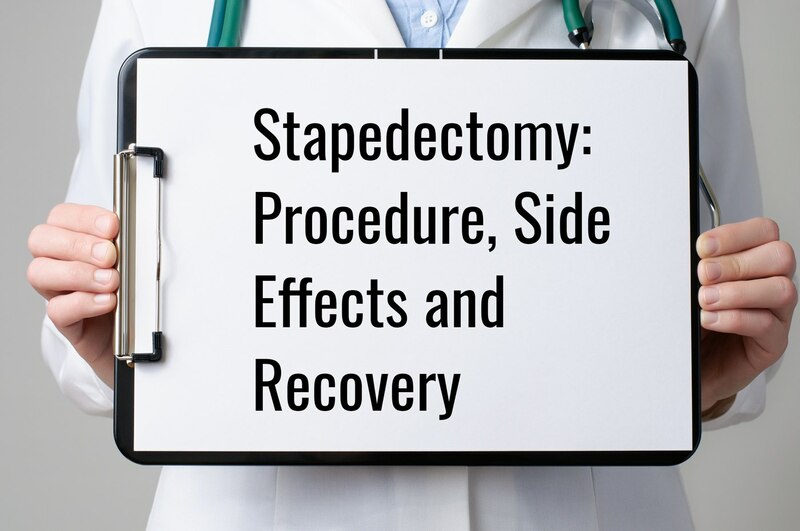 By following all instructions by your doctor and showing up to your follow-up appointment, you can help ensure the success of your stapedectomy procedure. If you've been diagnosed with otosclerosis and are considering stapedectomy surgery, contact us here at Houston ENT & Allergy Services for a consultation.